You are here: Home / Cancer Causes / Have You Been Lied to About Fluoride? There’s nothing like a glass of cool, clear water to quench your thirst. But the next time you turn on the tap, you might want to question whether that water is in fact, too toxic to drink. If your water is fluoridated, the answer is likely “YES.” Despite the fact that health “authorities” declare that it’s “safe” and “natural,” nothing could be further from the truth. In the 1920s, aluminum manufacturing, due largely to the thriving canning industry, was booming. But it was also a big producer of toxic fluoride waste. The biggest dilemma was the cost to safely dispose of this hazardous waste, since it was extremely expensive. The industry had been marketing and selling their toxic waste (sodium fluoride) as an insecticide and rat poison, but they wanted a much larger market …humans. However, they had a minor roadblock. In the October 1, 1944 Journal of the American Dental Association, the ADA warned that “the potentialities for harm (from fluoridation) far outweigh those for the good.” But in 1947, Oscar R. Ewing (a long-time ALCOA lawyer) was appointed head of the Federal Security Agency, a position that placed him in charge of the US Public Health Service. Under Ewing, a national water fluoridation campaign began. The public relations strategist for the water fluoridation campaign was none other than Sigmund Freud’s nephew Edwin L. Bernays, known as the “Father of Spin.” Bernays pioneered the application of Freud’s theories to advertising and government “half-truths.” In his book Propaganda, Bernays argued that scientific manipulation of public opinion is the key. He stated, “A relatively small number of persons pull the wires which control the public mind.” The government’s fluoridation campaign was one of his most enduring successes. Bernays’ techniques were simple. Pretend there is some favorable research by using phrases like “Numerous studies have shown…” or “Research has proven…” or “Scientific investigators have found…” but then never really cite anything. Say it long enough and loud enough, and eventually people will believe it. If anyone doubts or questions the lies, attack their character and/or their intellect. But What About The “Studies”? But weren’t there “scientific studies” that proved fluoride is safe? In the 1940s, scientists supposedly noted that people had better overall dental health – primarily fewer cavities – if they lived in areas where higher levels of fluorine occurred naturally. Since that time, the “studies” have come into question and there are serious concerns that much of the data was merely fabricated by scientists who had ties to companies that had a vested interest in selling fluoride. The fabrication of data in scientific studies is nothing new, especially when it comes to health. There are a number of companies who are designed to benefit from the poor health of the public. Contrary to popular opinion, fluoride doesn’t stop tooth decay at all. 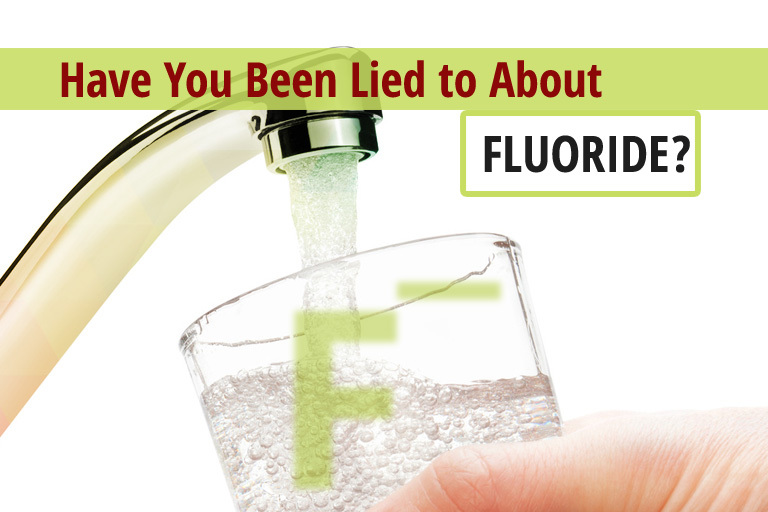 Scientific studies actually prove that fluoride is neurotoxic and causes birth defects, and osteoporosis. 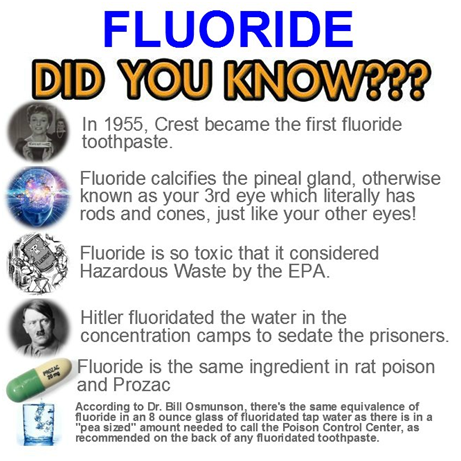 Fluoride also damages the immune, digestive, and respiratory systems as well as the kidneys, liver, and brain and can lead to learning disabilities, including dyslexia, ADHD and autism. In 2012, Harvard researchers reported that 26 of the 27 studies they reviewed found that childhood IQ decreased with increased fluoride concentrations. A 2006 report from the National Academy of Sciences reviewed hundreds of studies linking fluoridated drinking water to neurological damage, thyroid disorders, and … yes …. cancer. In 1955, the New England Journal of Medicine reported a 400% increase in the number of thyroid cancer cases in the years after San Francisco’s water began to be fluoridated. In 1977, Congress instructed the U.S. Public Health Service to conduct animal studies to determine whether or not fluoride causes cancer. After analyzing the study results in rats, it was found that animals who drank fluoridated water showed an increase in tumors and cancers in oral squamous cells, developed a rare form of bone cancer called osteosarcoma, and showed an increased in thyroid follicular cell tumors. The most significant finding was the occurrence of an extremely rare form of liver cancer, hepatocholangiocarcinoma in fluoride-treated male and female rats. Also in 1977, it was shown that fluoridation caused about 10,000 cancer deaths in epidemiological studies by Dr. Dean Burk, former head of the Cytochemistry Section at the National Cancer Institute and Dr. John Yiamouyiannis. Despite the findings occurring in 1977, they were not reluctantly released until 1989. In 2006, at Harvard University, researchers identified a link between fluoride and osteosarcoma. The study, led by Dr. Elise Bassin and published online in Cancer Causes and Control (the official journal of the Harvard Center for Cancer Prevention), found a strong link between fluoridated drinking water and osteocarcoma, a rare and often fatal bone cancer, in boys. The study confirms studies by the National Institutes of Health (NIH) and the New Jersey health department that also found increased rates of bone cancer in boys who drank fluoridated tap water. The findings confirmed those of a prior government study back in 1990 that involved fluoride-treated rats. Once inside your body, fluoride destroys your enzymes by changing their shape. Your body depends on thousands of enzymes to perform numerous cell reactions. Without enzymes, we would all be dead. Enzymes are sort of like a key that fits the locks inside your cells. However, once fluoride destroys the shape of the enzyme “key,” it no longer fits the lock and your body no longer recognizes the enzymes. These damaged enzymes can lead to collagen breakdown, DNA damage, tissue damage, and immune suppression. In early 2010, two separate stories out of India reveal that children are being blinded and crippled partly as a result of fluoride being artificially added to their drinking water. In the Indian village of Gaudiyan, well over half of the population has bone deformities, making them physically handicapped. Children are born normally, but after they start drinking the fluoridated water, they begin to develop crippling defects in their hands and feet. On April 12, 2010, Time Magazine listed fluoride as one of the “Top Ten Common Household Toxins” and described fluoride as both “neurotoxic and potentially tumorigenic if swallowed.”Truth be told, in almost every country in the world (including the USA), it’s against the law to “mass medicate” an entire population with a substance that everyone admits is toxic. Unfortunately, if you are a person who has the pleasure of living in a country in which English is the primary language, such as the United States, Great Britain, New Zealand, Australia or Canada, there is an overwhelming possibility that water fluoridation is common, as a part of an executive decision. This means that a decision has been made concerning your health without involving you in the process. Out of the nearly 320 million people living in the U.S., approximately 72% of them are consuming fluoridated water on a consistent basis. According to the CDC, all 50 states add fluoride to their water supply. Reverse osmosis is considered by most to be effective at removing fluoride from water. Fluoride salts tend to replace the iodine that thyroid glands need to function. Supplementing with food-grade iodine is vital. Supplementing with a high ratio of magnesium to calcium provides minerals that can help remove fluoride. Also, vitamin K2, extracted from nattokinase provides a defense against fluoride calcification in soft tissue organs such as the arteries and brain. Oh yes, one more thing you can do is stop using fluoridated toothpaste. Have you ever read the labels? I suggest that you do so. In 1997, the FDA ordered toothpaste manufacturers to add a poison warning on all fluoride toothpastes sold in the U.S. The warning says to keep away from children. I wonder why. Perhaps it is because if an entire tube of toothpaste were ingested by a small child, the dosage would likely be fatal! In early 2010, there was a huge volcanic eruption in Iceland. Animals in southern Iceland were at risk of fluoride poisoning if they inhaled or ingested the ash from the eruption. Fluoride poisoning can lead to internal bleeding, long-term bone damage, and tooth loss. According to BBC News (April 19, 2010): “The fluoride in the ash creates acid in the animals’ stomachs, corroding the intestines and causing hemorrhages. It also binds with calcium in the bloodstream and after heavy exposure over a period of days makes bones frail, even causing teeth to crumble.” Most folks never “connect the dots” between the tragic poisoning of these animals due to a natural event, and the poisoning of human beings through excessive fluoride exposure each and every day. 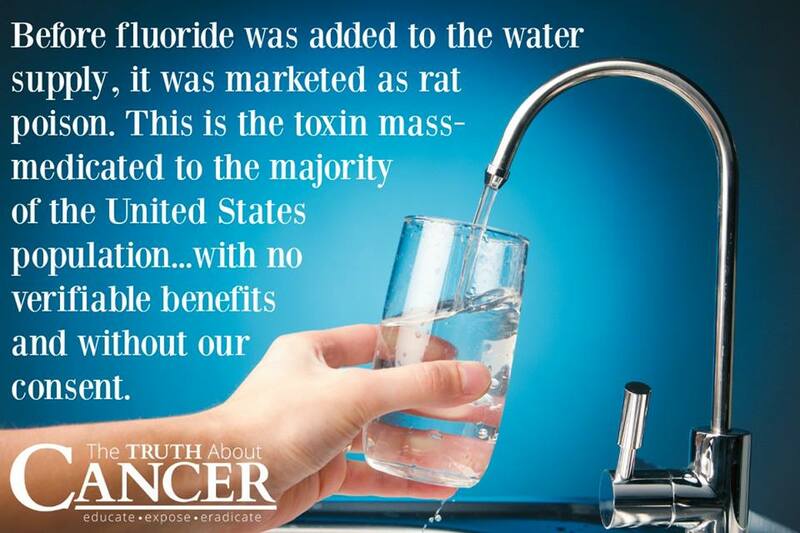 Not only that, it is one of the things that makes the fluoroquinolone antibiotics like Cipro and Levaquin even more toxic, and for those who have been poisoned (hundreds of thousands) we have to avoid fluoridated water like the plague. The thing about Hitler and fluoridated water is a myth. Fluoride is also not really an ingredient of Prozac. Please don’t use that infographic. You are wrong about Hitler. It is not a myth. And many many pharmaceuticals contain fluoride. (It is one reason the fluoroquinolones are so dangerous.) And to answer your question—no amount of fluoride is safe. Do a little homework. You could have answered all your questions/statements yourself. Sometimes I wonder if people would buy this: Hey, I have a new toothpaste! It’s really good at preventing cavities. But just a heads up: don’t put much on your toothbrush or it could make you sick. And please make sure you supervise young kids to make sure they don’t swallow any! If they do, call Poison Control asap. And it’s a good idea to rinse afterwards to make sure it doesn’t stay in your mouth. Sound good?? Would you want to use it? Of course not. >:( Read your toothpaste instructions!! That’s what you’re using now! Does this also relate to the dentist wanting to paint floride on our kids teeth? Should we not allow them to do this? I only developed a hypothyroid disorder after ingesting fluoridated water in the US. None of my relatives in Finland have thyroid problems, but Finland does not fluoridated water. Neither do any other Scandinavian countries or most of Europe. Also one of my otherwise perfect teeth was reabsorbed (dissolved) from the inside and now my little boy has had 3 otherwise perfect non cavity teeth dissolved from within while ingesting fluoridated water. Luckily these were desiduous baby teeth, but they were not otherwise ready to come out yet. I am convinced fluorides are the culprit. If you drop a tooth in the hydrofluorocilicic acid (HFSA), which is the most common fluoridation chemical added to the public water in the US, the tooth will dissolve. They put it in by 0.7ppm in the water supply, but it accumulates in the bones and damages the endocrine and the nervous system. Well thank God I live in Holland and they don’t fluoridate the water here! It would seem America is toxic on multiple levels sadly. You’re the richest country but you have a significantly lower life span than other civilized countries. Something doesn’t add up and it all starts with the powers that be, evidently. I reckon, being a U.S citizen nowadays, you need to be EXTREMELY savvy, wary of ANYONE in authority and completely take responsibility for your own health and educating yourself. Your freedoms and liberties are gradually being eradicated. No disrespect, I’d love to visit, but I wouldn’t wanna live in America for love nor money. Corrupt and dangerous on many levels. The water in Jamaica is fluoridate, what can i do to purify the water. Reverse osmosis…there are machines you can buy, or there may be a business that sells R/O water. But then you want to add back in the other minerals you need. Isn’t there a way to filter out flouride and other contaminents from the water while leaving the minerals? Fortifying water or foods with vitamins and minerals sounds a lot like creating synthetitcs to replace, real food, real water, etc. Synthethics are the root of the problem, the side effects of drugs, the harm to humans and life on earth. How about well water that has no fluiride in it? What is being done to convince villages, cities, counties, states, countries to STOP addding toxic chemicals to the water supplies? If you use reverse osmosis and you lose the minerals. All you have to do is get Celtic Sea Salt which is loaded with minerals. You need at least 1 to 2 teaspoonfuls a day. 1 teaspoonful in a large container of clean water and drink. I do. Thanks to Ty,myself and my husband drink purified water,and we also take three drops of nascent iodine daily!! 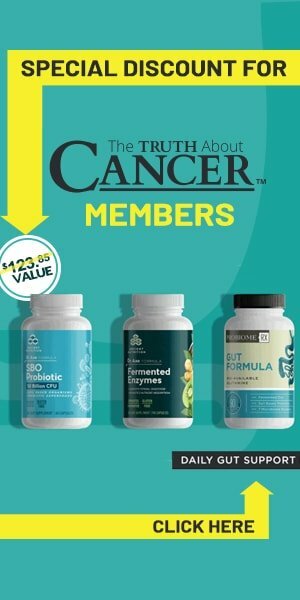 !I’ve followed Ty for many months “” the truth about cancer”” and I’ve learnt many truths and have completely changed my way of living,ive always take supplements,but now I’m able to take the right ones!! And at 72 yrs young I feel better now than I did 20yrs ago,keep up the good work Ty by keeping us informed about all these things!!!!! that is what we do as well. What is really sad about this is that i very sensitive teeth, and my Dentist gave me a Prescription for this Problem and he prescribed 3 tubes of Rising, Denta 5000 Plus which contains 1.1% Sodium Fluoride Prescription Dental cream which on the box is 5000 ppm Fluoride plus mild cleaning system rx only, i am suppose to Brush and floss w/ dry brush, no water, swish with own saliva for 30 seconds, then spit out, no eating or drinking for 30 minutes, now i know what ever goes into your mouth will be absorbed from under the tongue immediately and go into your system, That is not ok, i would rather suffer the teeth sensitivity problem Thanks for you Help doc, But NO thank you. i will be sending my dentist a copy of this information to let him know that i feel he is trying to poison me, or he believes in all the fluoride lies. Not to mention that fluoride actually damages teeth over time! Hi I’m looking at installing a 4 stage reverse osmosis filter but am wondering if it is better to add on a mineral alkaliser too to increase the ph levels. I have read that it may not be good to alkalise the water as it may disrupt the stomach’s ability to break down food and proteins and too much over long periods of time can cause alkalosis, throwing your body off-balance. Is it better to have the RO without the alkaliser/mineraliser? Any suggestions?? There are also sources and references at the bottom of some of the articles for further information.